Both RV satellite systems require a controller to point and locate/find available satellites. The true benefits you will receive for either is dependent upon how you intend to watch TV in your RV. Dome satellite systems are extremely convenient satellite systems in that they do not need to be raised or stowed when you arrive at or leave your destination. Domes are generally equipped with an internal GPS that will automatically lock onto available satellites in your region. The true benefit of a dome comes with an in-motion system. In-Motion dome systems do exactly like their name suggests and allow you to watch TV while your RV is in motion. This alone is their greatest asset. Dome systems are limited by the number and types of satellites that they can connect to. This results in limited HD channel viewing when stationary and complete loss of HD channel viewing while traveling. Dome systems are also latitudinally limited and tend to loose signal strength the farther north you travel. Weather, especially rain, can also affect signal quality. Raise up open faced dish satellite systems can only be used when stationary and thus will not allow you watch TV in your RV while moving. Once at your destination the raise up dish must be deployed, usually by simply pushing the find button on the controller, and can take up to ten minutes to locate and lock on to available satellites. The benefit of a raise up dish satellite system is that they can be equipped to receive signals from a wider range of satellites than dome satelitte systems resulting in the ability to receive and view true HD channels. Raise up dishes generally display greater signal strengths than dome systems due to their open face and greater surface area. In addition, raise up systems perform better at higher latitudes than dome systems and are less affected by rain, but are still susceptible to adverse weather conditions. Regardless of which RV satellite system you are using, weather and a clear line of sight are the two most common factors that can impede your ability to watch TV. If you’re dome or dish cannot lock on to satellites or the picture freezes or goes on and off, try moving your coach to improve the reception. Moving just a few feet to clear the line of sight of a tree of light pole can make a big difference in signal quality. If you are still unable to lock on it is possible that your controller may need to be re-calibrated or the internal memory of your controller updated to reflect current satellite coordinates. 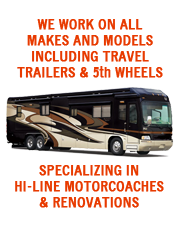 If necessary have your RV satelitte system looked at by an authorized RV repair center.